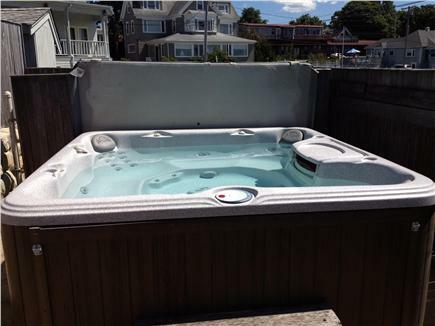 This meticulously maintained Monument Beach home is available for rent throughout Spring, Summer and Fall 2019. This home includes a large sauna in the basement, an outdoor above-ground pool, hot tub, barbeque grill, and shuffle board court - all enclosed in a well maintained, fenced in yard. This home comfortably sleeps 10 with four bedrooms, three full baths plus an enclosed outdoor shower, and a washer and dryer in a finished basement. Bedroom 1 has a queen size bed. Bedroom 2 has a double bed. 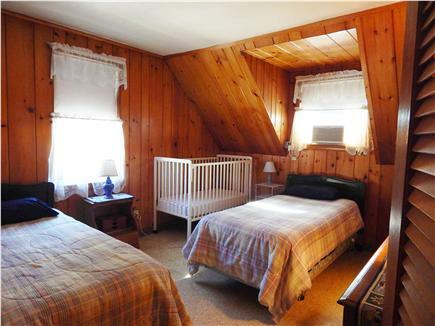 Bedroom 3 has two twin beds plus a crib. 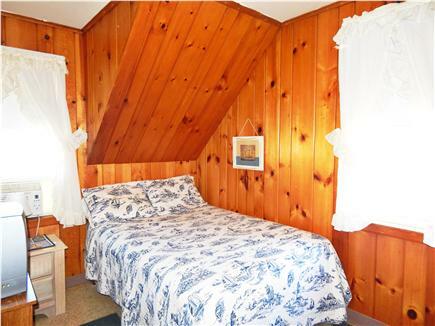 Bedroom 4 has two bunk beds (4 beds total). All bedrooms are air conditioned with bath towels, bed sheets, pillows & comforters are provided; the only thing you need to bring are beach towels and bathing suits!! The well equipped kitchen with an eat-in counter includes plates, silverware, pots & pans, refrigerator, oven/range, and micro-range. The quaint dining room off the kitchen seats 10 people, and the beautiful side porch has additional room for dining, watching television or reading a book. Also a large television/living room with views of the sundeck, Chester Park, and Phinney's Harbor. 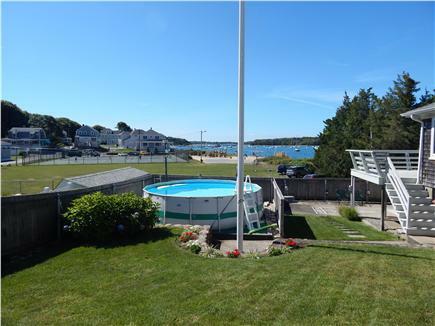 A large sundeck overlooks Chester Park, Monument Beach Marina & the public beach on Phinney's Harbor. Chester Park has two public tennis courts, basketball court, playground and beach. Monument Public Beach is a short 10 minute walk from the house down Shore Road. The beach is well maintained by the Town of Bourne and is a hidden gem. Located next to the Cape Cod Canal, you will be able to enjoy the many recreation areas and walking trails along the Canal. Sit on a bench and watch the beautiful yachts and sailboats cruise through the Canal. Guided boat tours of the Canal are available at the Bourne Marina located next to the Massachusetts Maritime Academy. A few of the local restaurants within a 10 minute ride include The Lobster Trap, Sunset Grill, The Chart Room, The Courtyard. Don't forget to hit the Whistle Stop Ice Cream Shop, which is a 5 minute walk from the front door. Also within a 5 minute walk is a bakery, pizza shop and Cumberland Farms convenient store & gas station. Old Silver Beach is about a 15 minute car ride. Falmouth Center is about 20 minutes away by car. In Woods Hole, Falmouth, you will be able to catch a ferry to Martha's Vineyard. 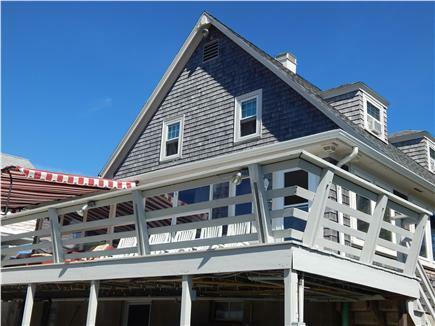 Hyannis Center is a 30 minute car ride with additional ferries to Nantucket and the Vineyard. Nearby golf courses include Brookside, Ballymeade, Cape Cod CC, and PineHills. Additional pricing info: State and local taxes of 12.45% will apply. Thank you for a wonderful relaxing vacation, it was perfect! The whole setting was like our little piece of paradise for a week. This place has everything you could think of -- sauna, pool, hot tub, shuffleboard, huge porch overlooking a park, tennis and basketball courts, playground, beach....not only does it have everything you could think of, it also is well stocked - you don't even have to bring beach towels - all were provided! Stayed for a week with our family. Could not have asked for a better place to stay. The amenities were endless including pool, hot tub, shuffleboard, corn hole and many board games. 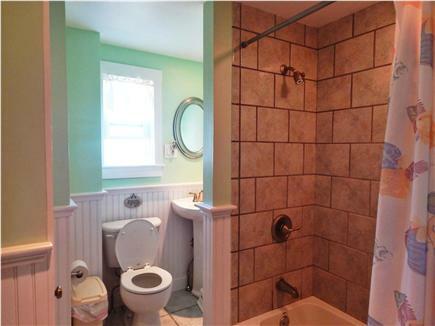 The house was very clean with plenty of towels and linens. Great neighborhood and short walk to private beach. Wish we could have stayed longer but will be back. Outstanding rental. We had a lovely family vacation here for 2 families vacationing together. We had 5 adults, 3 kids, and 2 babies under 1 year old. The family who owns this property is incredibly nice and helpful and really went out of their way to ensure that we felt welcome and had everything we needed for a great vacation. The house is fully equipped with many amenities including a pool, a hot tub, sauna, washer/dryer, outdoor shower (plus 3 full bathrooms inside), shuffleboard court, kayaks, lifejackets, boogie-boards (or kickboards for swimming), clothesline outside, gas BBQ grill, big new high quality TV in family room, landline phone, cable tv, wifi, parking for 3 cars, beach towels, bed linens, etc. We especially appreciated having AC in every bedroom and the main living area as it was really hot the first few days and it's hard traveling with babies. This has been the family's summer house for generations, and there are many personal family touches. The decor in much of the house is not updated, and is probably original, but it gives the sense of being a guest in a much-loved family home and not just another generic rental. 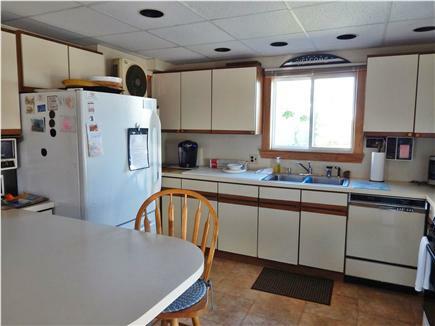 The fridge, microwave, Keurig coffeemaker, and oven/stove are all full-size, recent models which was nice. There was plenty of seating in the family room and in the kitchen and porch dining areas for everyone to eat. It doesn't show in the photos at the time we looked but the 2 upper bunks had nice safety rails to prevent rolling off. One bunk has a ladder and one doesn't, relying instead on a good climber. 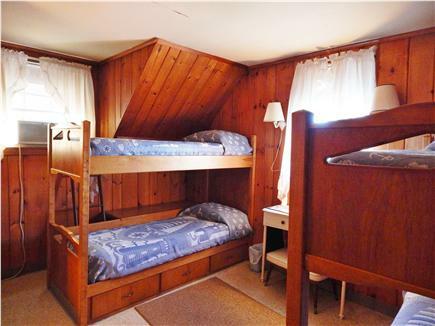 We didn't use them but would suggest for others that the upper bunks are suitable for teens, not younger kids. 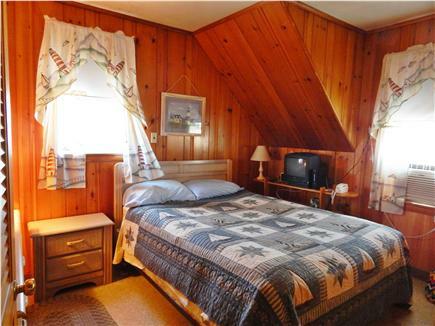 The location is great, right across from the park with a playground, field, tennis courts, and small beach. The beach is not a great quality sand but what it lacks in quality it makes up for in convenience and you can walk to a larger slightly better beach a few houses down. From the back deck, you can see the park and playground and so older kids can go and you can keep an eye on them. It's nice to sit under the awning and see the ocean, too. It's a very short walk to the ice cream shop, bakery, pizza place, and a big Cumberland Farms convenience store but the location is very quiet with long-time owners and their grandkids. This was fantastic. They had everything here including soap, paper towels, all cooking utensils, sunscreen, kayaks, rafts, and shuffleboard game. So comfortable. The Welch family are wonderful and very friendly. They take care of everything. I stayed for two weeks..I would stay for two years if I could.